This will probably come as no surprise to those of you who have followed this story, but the European Parliament has voted against the much maligned Anti-Counterfeiting Trade Agreement. And they voted against it in some numbers with just 39 in favour, 165 abstained and 478 were against - interesting given that all but 5 of the EU's 27 member states have already signed up to the Treaty. That said, two of the missing signatories were Germany and the Netherlands. There was plenty of comment from both sides of the argument: Jim Killock of the Open Rights Group told told reporters: "This is a tremendous victory for the movement, for democracy and for every European citizen that has demanded that their rights be respected. 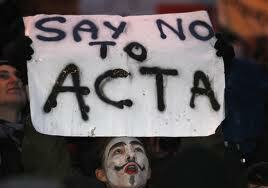 ACTA must be abandoned. The Commission must drop its calls to try again. ORG would like to thank the thousands of activists from the UK that helped persuade MEPs to stand up for democracy" whilst Anne Bergman-Tahon of the Federation Of European Publishers told reporters: "ACTA is an important tool for promoting European jobs and intellectual property. Unfortunately the treaty got off on the wrong foot in the Parliament, and the real and significant merits of the treaty did not prevail" and Frances Moore for the International Federation Of The Phonographic Industry said: "We now await the ruling of the Court Of Justice of the EU, and urge the European Parliament to make effective intellectual property rights enforcement a top priority in our external trade policy".